In The Tree of Yoga, one of the world’s foremost teachers of yoga offers his thoughts on many practical and philosophical subjects, ranging from the place of yoga in daily life to insights from Patanjali’s Yoga Sutras. He includes chapters on family life, love and sexuality, health and the healing arts, meditation, death, and advice to teachers. Based on lectures and discussions with his students, the text is enlivened by many of the author’s personal experiences in the practice of yoga postures and breathing as well as in putting spiritual principles into action. Consider the sky. The sky is finite as well as infinite. None can touch it, yet we are in contact with it at every moment of our lives. Similarly, you and I have to use finite means—body, mind, intelligence and consciousness—to reach the infinite seat of the soul which is the mother of all these things. In this way we remain ever fresh, ever peaceful, and with ever growing intelligence. B.K.S. Iyengar has devoted his life to the practice and study of yoga. It was Mr. Iyengar's unique teaching style, bringing precision and clarity to the practice, as well as a mindset of yoga for all, which has made it into a worldwide phenomenon. His seminal book, Light on Yoga, is widely called the bible of yoga and has served as the source book for generations of yoga students around they world. Using the tree as a structural metaphor for both life and yoga practice, The Tree of Yoga brings the wisdom of his many years of practice and its application in real life into a single-volume work. These are his core teachings and advice for living a long, healthy, happy life. Also by B.K.S. Iyengar are Core of the Yoga Sutras and Yoga: The Path to Holistic Health. The definitive guide to yoga in everyday life from B.K.S. Iyengar, the worlds most respected yoga teacher. B.K.S. 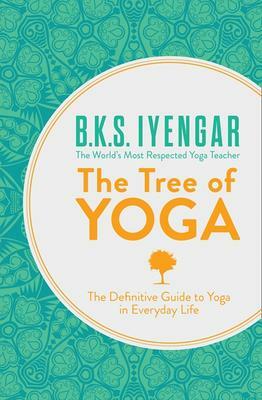 Iyengar has devoted his life to the practice and study of yoga. It was B.K.S. Iyengars unique teaching style, bringing precision and clarity to the practice, as well as a mindset of yoga for all, which has made it into a worldwide phenomenon. His seminal book, Light on Yoga, is widely called the bible of yoga and has served as the source book for generations of yoga students around they world. In Tree of Yoga, the collected wisdom of his many years of practical practice and its application in real life are brought into a single-volume work. A collected philosophy for life researched through decades of practice by B.K.S. Iyengar, the worlds most respected yoga teacher. These are his core teachings and advice for living a long, healthy, happy life.